You are viewing courses for Illinois. Select a Different State. National Academy of Continuing Legal Education is an Accredited CLE Provider in Illinois. The MCLE Board of the Supreme Court of Illinois maintains an Accredited Provider directory on their website. Illinois attorneys can satisfy their entire CLE requirement with NACLE using our DVDs, Audio CDs, Online & iOS/Android App formats. The MCLE Rules require the completion of 30 hours of CLE activity in a two-year reporting period. An attorney’s reporting period depends on the first letter of the attorney’s last name as it appears on the master roll of attorneys. Illinois attorneys with last names beginning with A-M are due on June 30 of each even numbered year and attorneys with last names beginning N-Z are required to complete their requirement on each odd numbered year. Newly Admitted attorneys in Illinois must complete 15 total credit hours within 1 year of being admitted. This requirement consists of a 6 credit Basic Skills course that has been approved by the MCLE Board to meet the Basic Skills requirement, as well as 9 additional hours of approved CLE credits. Newly Admitted attorneys can fulfill their entire requirement with NACLE using our DVDs, Audio CDs, Online & iOS/Android App formats. Your CLE requirements must be completed by the last day of the month that occurs one year after your admission to practice in Illinois. (S. Ct. Rule 793(b). Newly Admitted attorneys can carry over up to 15 hours including 6 hours of Professional Responsibility credits to your initial two year experienced cycle. Attorneys must self-report completion of CLE to the MCLE Board of Supreme Court of Illinois. The Certificate of Completion issued by National Academy may be used to verify attendance. Up to 10 hours, including ethics hours may be carried over to the next reporting period. The deadline to report is 31 days after the end of the attorney's reporting period. Attorneys can Report Online. Benjamin Ferencz was only 27 years old when he was assigned the role of Chief Prosecutor at the Nuremberg trials and successfully convicted all 22 Nazi defendants for their participation in the murder over a million people. 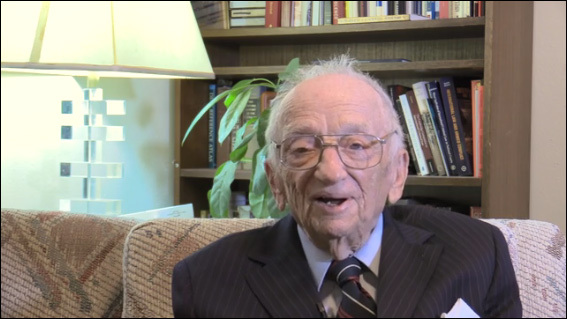 Now in his 100th year of life, Mr. Ferencz recounts his lifetime of work focusing on issues of international criminal justice in this captivating CLE course. Mr. Ferencz discusses the growth of international criminal law and the prosecution crimes of aggression including genocide and human rights abuses as well as the modern day threat posed by state-sponsored cyber attacks. After he graduated from Harvard Law School in 1943, Ben Ferencz joined an anti-aircraft artillery battalion preparing for the invasion of France. As an enlisted man under General Patton, he fought in every campaign in Europe. As Nazi atrocities were uncovered, he was transferred to a newly created War Crimes Branch of the Army to gather evidence of Nazi brutality and apprehend the criminals. Ferencz became Chief Prosecutor for the United States in what the Associated Press called "the biggest murder trial in history." His book Defining International Aggression-The Search for World Peace was published in 1975. It seemed to him that there was little sense in denouncing aggression, terrorism, and other crimes against humanity unless these offenses became part of an accepted international criminal code enforced by an international court. He wrote another two-volume documentary history, An International Criminal Court-A Step Toward World Peace, which was published in 1980. It was intended to be a tool that nations could use to build a structure for peace. Mr. Ferencz lives with his wife, Gertrude, in Florida and New York. They have four grown children. He continues to write and speak worldwide for international law and global peace. National Academy of Continuing Legal Education is an Accredited CLE Provider in Illinois. To view our full accreditation details, please click here.